In honour of April Fools' Day, I thought I'd share with you one of the most foolish domain names I've come across so far this year. I discovered this little gem when I was driving around one rainy night in Los Angeles. 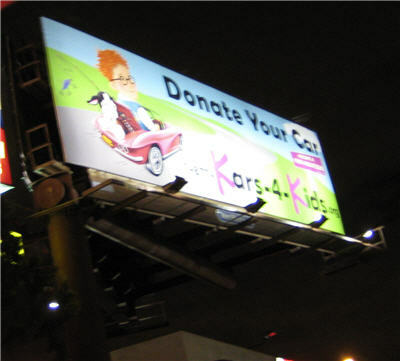 While stopped at a red light, I looked up and saw a large billboard ad for a vehicle donation charity. That's right, "kars" with a "k", plus not just one but TWO dashes, and all ending in a .org domain extension. Good luck trying to remember this domain name! 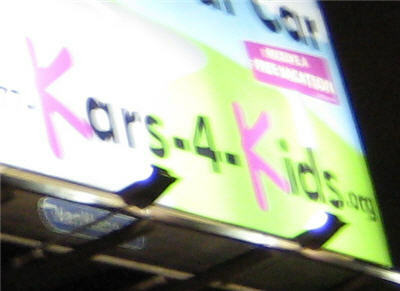 Thankfully, I had a camera with me to record the domain name, so when I got back to my computer I typed in www.kars-4-kids.org. Guess what? The billboard got it wrong! kars-4-kids.org is not owned by the organization, and is in fact just a parked domain. The organization can actually be found at kars4kids.org (without the dashes). Somebody please fire the genius who thought it would be a great idea to add a few dashes to the domain name and then spend who knows how much plastering it on billboards all over the country. What if you didn't happen to have a photo of the billboard and had to rely on memory? Hey, it could happen. Say, for instance, when you next found yourself at a computer you typed in carsforkids.org. Turns out that carsforkids.org takes you to a different organization doing roughly the same thing: charitable donations of cars for kids! Last month, I watched with fascination and amazement as the domain name shoppers.com expired and was then purchased at auction on Pool.com. While it was impressive what the expired domain name sold for - $166,000 (USD) - what really blew me away was that the original registrant (owner) of this domain name let it expire. That's right, instead of paying a mere $10-20 to renew this terrific generic domain name, they somehow let the domain expire and ultimately end up in the hands of one of the domain dropcatching services (Pool.com), who then put the name up for auction. What was the original registrant of this domain name thinking? How the heck did they let this domain name expire? And what must it be like for them to discover after the fact that a domain name they could have renewed for a few dollars sold for a small fortune? I think there are some lessons to be learned here for any individual or business that owns a domain name or two. First of all, for the domain names you intend to hang on to, are you sure you know when the domain names are coming up for renewal? Have you put the renewal date in your calendar to ensure you renew the domains in time? And if you are planning to NOT renew a domain name, are you aware of the potential value of that domain name on the aftermarket? Rather than let it just drop, have you thought about pro-actively putting the domain name up for sale? Most people only dream about owning domain names that would sell for six-figures, but that's no excuse for not paying close attention to these valuable assets. Had the original owners of shoppers.com followed this advice, they'd have avoided making a $165,990 mistake.